Carrie Wright (email: clwright@usi.edu) teaches geology at the University of Southern Indiana, including the Geology of Gemstones, in which she incorporates the history of jewelry styles. She is also working towards a Master of Arts in English at USI. This essay represents a melding of her research interests. jane Austen’s letters portray a woman with a keen interest in the minutiae of fashion and dress, including jewelry. Her letter to Cassandra of 26-27 May 1801 refers to the sisters’ well known jeweled possessions—their topaz crosses on gold chains, presents from their sailor brother Second Lieutenant Charles Austen, who had recently earned prize money in the capture of a French ship. Jane writes, “He has received 30£ for his share of the privateer & expects 10£ more—but of what avail is it to take prizes if he lays out the produce in presents to his Sisters. He has been buying Gold chains & Topaze Crosses for us;—he must be well scolded. . . . —He will receive my yesterday’s letter to day, and I shall write again by this post to thank & reproach him.—We shall be unbearably fine.” Jane’s epistolary manner is jokingly stern as she feigns indignation in relaying her reaction to her brother’s gift, belying the delight she must have felt in receiving the fashionable topaz gems in the tiny crosses. Jane’s description of the sisters when they wear the necklaces as “unbearably fine” continues the jest, mockingly referring to the imagined overbearing pride and boastfulness with which they could wear the jewels and incite the envy of their social circle. 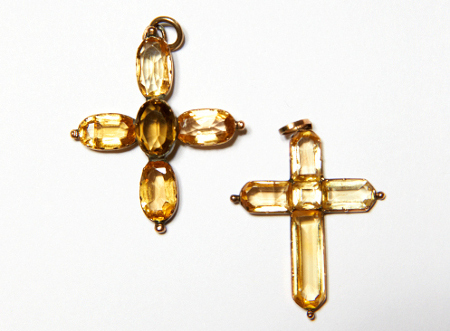 The phrase could also connote Jane’s disapproval of over-ornamentation or allude to feelings similar to those of Mansfield Park’s Fanny Price for her brother William’s gift of an amber cross—the acute awareness of the precious nature of the gifts from a beloved brother and the anxiety inherent in wearing such a gift appropriately in public. More positively, the word “unbearably” could refer, in exaggeration of such a burden, to the Austen sisters’ immense gratitude for Charles’ brotherly generosity in the wake of receiving hard-won prize money. The imaginable permutations of the phrase “unbearably fine” are as multifaceted as the topaz crystals in the crosses, implying Jane’s understanding of the multitudinous significances of jewelry. Whether worn as evidence of social superiority to create jealousy in others (joking or not), or as a symbol of a brother’s love, jewels have social power. Regency women wore jewelry as a signifier of nobility or gentility. Because sumptuary laws were more custom than legal reality (Duckworth 84), luxury items like jewels were also evidence of “conspicuous consumption,” or “the acquisition and use of things for the purpose of displaying to others your wealth, power, and status” by the nouveau riche (Benedict 346). Hence, jewelry became another emblem of the competition to ascend to higher rungs on the social ladder of Regency England. Jane Austen had a “jeweler’s eye for social gesture at work” (Yoder 608), suggesting that every tiny facet of her characters, including their use of jewelry, is a means to expose their vices and virtues as well as the broader socio-political implications of these tiny jewels. In this paper, I will trace a selective history of jewelry styles during Austen’s lifetime to examine the social and political power dynamic of jewels in her novels within the macrocosm that was her world. 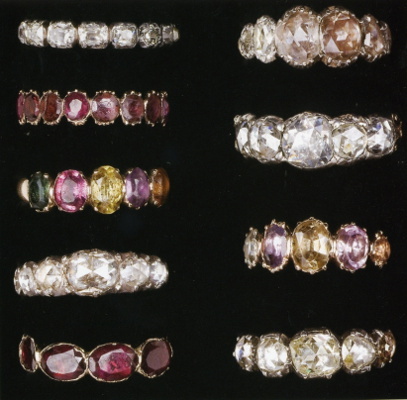 At the time of Jane Austen’s birth in 1775, opulent sets of matching jewelry dripping with precious gems were very popular among aristocrats in England and the continent, remaining so at least until the French Revolution. Faceted gems sparkled in candlelight at evening social gatherings, reflecting not only light but also the wealth and status of the wearer. Venetian lapidary Vincenzo Peruzzi invented the brilliant cut for diamonds in 1700, enabling gem cutters to maximize the diamonds’ dispersion of light into its spectral colors and quickly replacing older cuts like the rose (Gregorietti 233). This prismatic effect, commonly called fire, made diamonds and their imitations the dominant jewels. 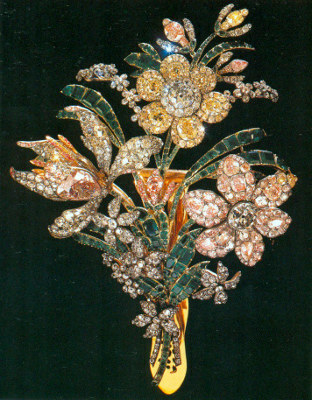 The sumptuous excess of Louis XV’s gem-encrusted reign included jewelry containing precious stones of various sizes, shapes, and colors in voluptuous floral and foliate designs. In both examples, pictured below, the gems are predominant while the metal foundation is subtle or hidden by the plethora of stones. Rose and brilliant-cut diamonds. European, c.1780. Bouquet of brilliant-cut diamond flowers and emerald stems. Russia, c. 1760. La Bibliotheque des Arts, Paris. Such a multitude of gems would seem excessive to those unable to afford enough food, much less a dazzling piece of jewelry. As Duffy and Boscagli write, “Jewels . . . are bedeviled by their historical associations, their old-fashioned role as blatant signifiers, displayed upon the royal body, of despotic power” (190)—especially in the context of the French fashion of overindulgence that led, in part, to the overthrow of the monarchy during the French Revolution. The diamond necklace affair of 1785-1786 in Paris exemplified the attraction of jewelry and its power to destabilize the monarchy. As the story goes, Louis XV originally commissioned the necklace for his mistress Madame du Barry. The diamond festoon necklace was a rivière of diamonds in a collar style with loops and pendants hanging down and an incredible number of faceted diamonds—647 brilliant-cut stones weighing 2800 carats, or one point two pounds (Phillips 114). The opulence of the necklace was emblematic of the privilege of the elite and the devastatingly unjust distribution of wealth in France and therefore an insufferable “positional good” (Duckworth 89). 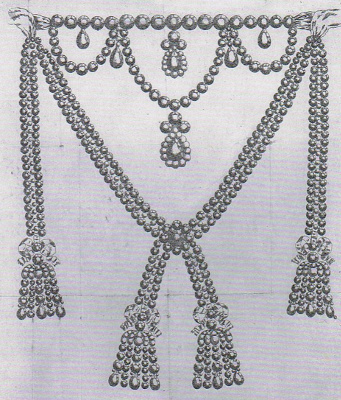 Engraving of the diamond festoon necklace, 1785. Musée National des Cháteaux de Versailles. Replica of the diamond festoon necklace. When the king died before the necklace was completed, the jewelers, Charles Bohmer and Paul Bassange, frantic for a buyer, unsuccessfully approached Marie Antoinette. The Queen, satirized as “Madame Déficit,” wisely, if uncharacteristically, abstained from purchasing the necklace (Pointon 150). Despite her demurral, however, the jewelers enlisted the help of a scheming courtier, the Countess de la Motte, and Prince Louis de Rohan, a cardinal anxious for the Queen’s favor, to tempt Marie Antoinette to go through with the purchase. La Motte tricked the cardinal and the jeweler, recruiting a prostitute to impersonate the Queen and obtaining the necklace under the auspices of buying it. La Motte immediately sent it off to Europe to be dismantled and sold. The ensuing parliamentary trials cleared the cardinal and the prostitute of wrongdoing and literally branded La Motte a thief, but “although [she was ] clearly innocent, the association of the Queen’s name with low intrigue and, particularly, with diamonds, irreparably damaged her position” (Pointon 152). The most notorious in eighteenth-century France, the scandal, with its ensuing court cases, “wrecked the foundations of the state and led to the French Revolution” (Pointon 147). It created a politically hazardous situation for the French monarchy because it enabled the populace to critique it. 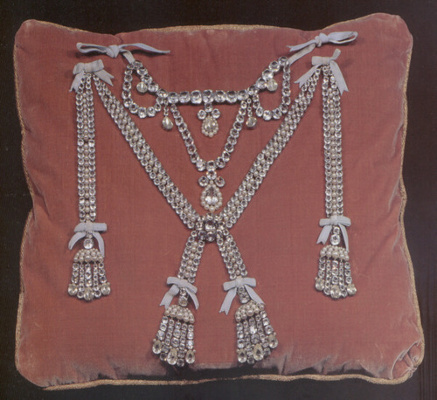 As a result of the French Revolution, the extravagant mode of ornamentation exemplified by the diamond necklace was abandoned, like the monarchy that supported it, for the more rational and symmetrical neoclassical style. This style had become increasingly popular following archeological finds in Pompeii and Herculaneum, exemplifying classical values of justice and temperance. During the Reign of Terror, a period characterized by rapid changes in what was considered fashionable—or safe—possession of gem-studded jewelry was associated with the aristocracy and therefore cause for trial (or not) and execution by guillotine. Opulence was politically incorrect at best. Natural gems were recycled as older pieces of jewelry were dismantled and remade into the more rational, restrained neoclassical style, with notably fewer gemstones per square inch. As the jewelry of France’s previous elite was broken up and sold, in part to fuel the new republic, the market was flooded with French diamonds (Phillips 68). The transition in jewelry styles paralleled or even mirrored the changes in the socio-political landscape in France and abroad. The pair of guillotine earrings from Paris, manufactured during the Reign of Terror, and the classically themed busts in a cast glass cabochon make the point. The juxtaposition of the violence inherent in an instrument of execution with the serenity of the Romanesque faces is both striking and emblematic of the shockingly swift changes of the period. 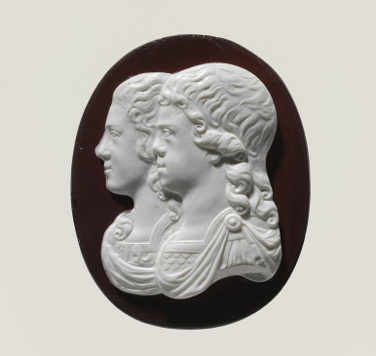 Cast glass cameo, c. 1791. © Metropolitan Museum of Art. 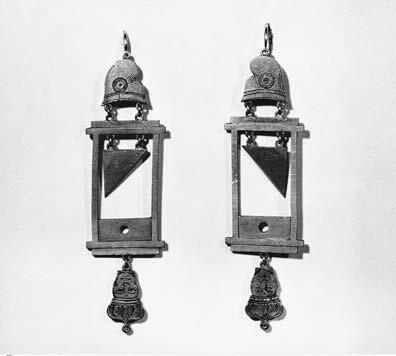 Guillotine earrings, France, ca. 1794. © Musée Carnavalet, Paris. 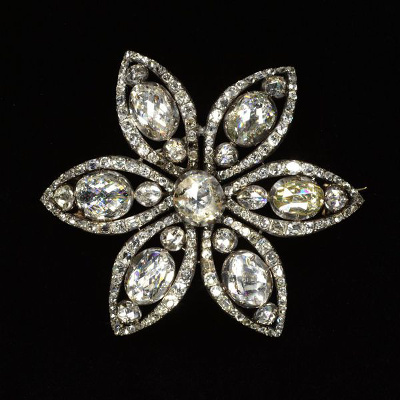 Following the Revolution, in the words of jewelry historian Ernie Bradford, there was a “deliberate austerity and a paucity of jewelry display” (89); “as always, the arts of luxury were the first to suffer at the hands of Equality” (96). Even in the midst of this political upheaval, however, France maintained its influence on dress and jewelry fashions (95). A new France warranted new dress styles, fashions that bucked the trends of the lavish old Court, and ushered in the simpler pseudo-Greek styles of dress that required plainer or no jewelry. The burgeoning middle class also demanded cheaper alternatives, including “semi-precious” gemstones and imitations in order to visibly emulate their social betters through the display of the trimmings of wealth. The market responded to this craving with a proliferation of imitation cameos and glass paste gems counterfeiting diamonds, emeralds, rubies, topazes, aventurine, and even opals. The paste formed a hard leaded glass with optical properties similar to many gems and could be faceted, usually with rose or other simple cuts, and backed with foil to change or enhance the color. Faceting made the imitation gems glitter in the candlelight, just like the authentic gemstones they were manufactured to mimic, a metaphor for the middle class imitating the aristocracy (who might imagine that imitation as an intolerable usurpation of rank). Sometimes these imitation gems, particularly the glass pastes, were so sophisticated that non-jewelers and non-lapidaries could not tell the difference, making them appropriate for use by the financially fallen aristocracy as well as for would-be aristocrats or social climbers. Despite the political and social upheaval, France maintained its stylistic dominance in fashion throughout Jane Austen’s lifetime in Britain and on the European continent. Hungry for French jewels, wealthy English men and women flocked to Paris during the 1802-1803 truce between the nations and again following Napoleon’s defeat in 1815 (Scarisbrick 320). The post-Revolution changes in dress and jewelry, steeped in Neoclassicism, trickled across the Channel, appearing in publications devoted to fashion such as La Belle Assemblée, The Ladies Magazine, and the Parisian refugee Nikolaus Wilhelm von Heideloff’s Gallery of Fashion, published in Britain 1794-1803. Along with these magazines, news of Parisian vogues was disseminated through French fashion dolls, letters, and word of mouth from London and other cities to the English countryside. In her letters to Cassandra, Jane Austen reveals an acute awareness of fashion trends through perceptive observations of and experiences with fabrics, hosiery, trimmings, sleeve lengths, petticoats, hats, and more. In her works, however, Austen’s descriptions of clothing and accessories are relatively scarce, making each item of clothing and jewelry all the more meaningful within the social economy of the novels. The relationships between Austen’s characters and their fashionable possessions illuminate the morality of their desires as they use jewels as a currency of social power. Isabella Thorpe envisages wielding jewels to attain her selfish social desires in Northanger Abbey, Austen’s parody of the Gothic novel. Isabella is a devious social climber who upon receiving word that her marriage to James Morland has been approved by his father, “saw herself at the end of a few weeks, the gaze and admiration of every new acquaintance at Fullerton, the envy of every valued old friend in Putney, with a carriage at her command, a new name on her tickets, and a brilliant exhibition of hoop rings on her finger” (122). Isabella immediately envisages herself with all of the accoutrements of a very wealthy woman, her desire for a “brilliant exhibition of hoop rings” illuminating her motivations for marriage as monetary and material rather than as love. There is not even a balance between the two: her future husband, James, plays no part in her daydream of marriage. The unbroken circle of the bands implies mutual commitment and eternal affection, so without the context of Isabella’s scheming to catch a husband, the reader might assume she was imagining her husband’s love for her in the form of love jewelry, rather than fantasizing about how her possessions would make her superior to her acquaintances. Or perhaps not. Isabella imagines not the plain wedding band that would semiotically convey her married status but rather the gem-encrusted finger rings so popular among the wealthy (Bradford 86). The term “hoop ring,” a general category of rings, includes plain gold wedding bands as well as rings set with stones in a line along the band. The adjective “brilliant,” however, along with the plural “rings,” indicates the latter. Hoop rings in the British Royal Collection, owned by Her Majesty Queen Elizabeth II. Acrostic hoop ring. © Julie Wakefield, AustenOnly.com. 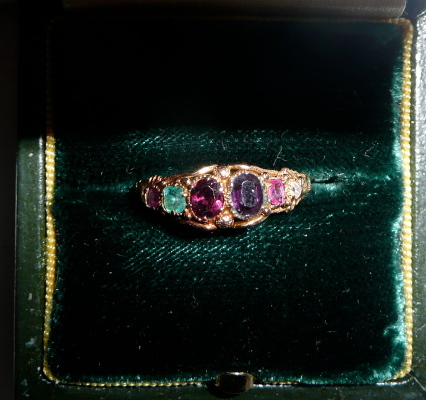 Sentiment might be married to display in an acrostic hoop ring, in which gems were arranged to form a sentimental message according to the names of the gemstones: in the example above, ruby, emerald, garnet, amethyst, ruby and diamond spell out “REGARD.” According to Diana Scarisbrick, “more than one ring could be worn on the finger, and hoops, enameled or set with stones or pearls round half the entire circumference were very popular” (362). Items of jewelry could be used as “cultural markers” (McMaster 125) of pecuniary power in a manner Isabella can only imagine. Elizabeth, Duchess of Devonshire, for example, in an 1819 portrait by Sir Thomas Lawrence, wears jewelry only on her fingers, but she makes it count, wearing at least one hoop ring on each finger. More was clearly better, and we can readily envision Isabella’s fantasy, the radiance of her fingers bejeweled in multitudinous rings. Isabella’s true desire is the power to instill envy and admiration in others, and though she professes to love James Morland, her fantasies of jewelry reveal that she sees him primarily as a means to social victory and “uninhibited self-display” (Benedict 349). In fact, she sets her sights on a richer prize, the handsome Captain Tilney, soon after being disappointed in James’s future income. Anxious for William Goulding (and everyone else) to appreciate and acknowledge that she is married, Lydia uses her ring to mark her person as such; she craves the congratulations and approbation attendant upon newlyweds. Her story, an obvious gesture of boastfulness, highlights her ring as a gateway to the socially gratifying reactions to a bride and groom. Within her own family, only her approving and equally ill-mannered mother obliges her with praise and adoration. While Lydia singles herself out for special attention by showing off her ring to neighbors, family, and even the servants, Mrs. Elton uses jewelry in a similar maneuver for attention in Jane Austen’s Emma. Experiencing a lull in notice from Jane Fairfax and the other attendees of the Highbury ball, Mrs. Elton remarks to Jane, “‘Nobody can think less of dress in general than I do—but upon such an occasion as this . . . I would not wish to be inferior to others. And I see very few pearls in the room except mine’” (324). Mrs. Elton makes plain her plentiful pearls in an example of “ostentatious prestige-flaunting and conspicuous consumption” (Duffy and Boscagli 199), implying her superiority in fashion and social rank, especially with respect to Jane Fairfax. In this sense, Mrs. Elton’s prosperity becomes an embarrassment of riches in a society in which one should avoid vulgarity, avoid being “too loud, too explicit about the possession of wealth” (Michie ix). Mrs. Elton’s assertion of her power through her pearls represents the “assault on gentility of the new mercantile middle class” and the negative consequences of social mobility in Jane Austen’s England (McMaster 119, 120). There is no detail in the text, but pearls were worn in every possible item of jewelry, most commonly in earrings and necklaces, which were less liable to damage; pearl bracelets and rings were also prevalent. Given Mrs. Elton’s excessive personality, excessive talk, and apparent excess of “‘resources’” (Emma 307), readers might imagine her adorned with all of the above, including a tiara, like “‘the queen of the evening’” Miss Bates describes her as (329). It’s more likely, however, that her fortune would relegate her to perhaps pearl earrings and a necklace. In contrast to Isabella’s, Lydia’s, and Mrs. Elton’s manipulative use and pleasurable exploitation of jewelry, Fanny Price’s superior morals, social hypersensitivity, and inferior financial situation lead her to the bittersweet combination of anxiety and gratitude as the recipient of gifts of jewelry in Mansfield Park. Under the social duress of deciding on her attire for the impending ball at Mansfield, Fanny’s only jeweled accessory, “a very pretty amber cross which William had brought her from Sicily, was the greatest distress of all, for she had nothing but a bit of ribbon to fasten it to” (254). The quest for a more appropriate necklace on which to wear the jewel results in brief episodes of pleasure but soon forces her into uncomfortable feelings of obligation to the amoral Henry and Mary Crawford and painful exposure to Edmund Bertram’s marital intentions towards Mary. Items of jewelry shape relationships between these characters by symbolizing sentiment and conveying social duties. The amber cross, a symbol of William’s love for his sister as well as her piety, is a conundrum because Fanny feels compelled to wear it to show her appreciation for her brother’s generosity but fears embarrassment over the mediocrity of the “bit of ribbon . . . in the midst of all the rich ornaments which she supposed all the other young ladies would appear in” (254). Fanny’s fretful conscientiousness is only exacerbated when Mary Crawford manipulates her into accepting a gold chain originally given to her by Henry Crawford, exhorting Fanny to think of them both whenever she wears it, thereby giving Henry a hold over Fanny, the unwilling object of his flirtations. Wearing Henry’s chain, a “doubtful good of a necklace” (261), would symbolically yoke her to a man she does not esteem—an unbearable emotional burden of gratitude—and her disquietude is only mollified upon receiving a more suitable gold chain from her beloved Edmund, to whom she would much rather be bound. Fanny’s resulting “thousand feelings of pain and pleasure” shift to dejection when Edmund expresses greater pleasure in Mary’s generosity than in giving Fanny a gift himself. Mary’s gift softens Edmund’s view of her faults, pushing him closer to proposing to her. Edmund therefore discourages Fanny from returning the unwanted Crawford chain to avoid subjecting Mary to the mortification of a rejected gift and risking a rift between “‘the two dearest objects I have on earth’” (264). Mary’s gift thus becomes a symbol not only of Fanny’s duty of gratitude towards the Crawfords but of Edmund’s tender consideration and esteem for Mary. Edmund overrides Fanny’s inclination to return the chain, and Mr. Crawford heightens Fanny’s sense of unwelcome indebtedness when he smiles, glancing at her necklace, and pointedly asks her to dance, “which made her blush and feel wretched” (274). The implicit social significance of receiving and wearing the cross and chains supersedes Fanny’s fleeting moments of pleasure in the gifts, which contour the relationships and social obligations between her and other characters in the novel. Special thanks to Susan Allen Ford, Editor of Persuasions/Persuasions On-Line, and Julie Wakefield of AustenOnly.com. Austen, Jane. Jane Austen’s Letters. Ed. Dierdre Le Faye. 4th ed. Oxford: OUP, 2014. _____. The Novels of Jane Austen. Ed. R. W. Chapman. 3rd ed. Oxford: OUP, 1933-1969. Benedict, Barbara M. “The Trouble with Things: Objects and the Commodification of Sociability.” A Companion to Jane Austen. Ed. Claudia L. Johnson and Clara Tuite. Chichester: Wiley, 2012. Bradford, Ernie. Four Centuries of European Jewellery. London: Spring, 1967. Duckworth, Alistair. “Manners in Jane Austen’s Novels.” Re-Drawing Austen: Picturesque Travels in Austenland. Ed. Beatrice Battaglia and Diego Saglia. Napoli: Liguori, 2004. 83-103. Duffy, Enda, and Maurizia Boscagli. “Selling Jewels: Modernist Commodification and Disappearance as Style.” Modernism/Modernity 14.2 (2007): 189-207. Evans, Joan. A History of Jewellery 1100-1870. Boston: Boston Book and Art, 1970. Gregorietti, Guido. Jewelry through the Ages. New York: American Heritage, 1969. McMaster, Juliet. “Class.” The Cambridge Companion to Jane Austen. Ed. Edward Copeland and Juliet McMaster. Cambridge: CUP, 2011. 111-26. Michie, Elsie B. The Vulgar Question of Money: Heiresses, Materialism, and the Novel of Manners from Jane Austen to Henry James. Baltimore: Johns Hopkins UP, 2011. Phillips, Clare. Jewelry from Antiquity to the Present. London: Thames, 1996. Scarisbrick, Diana. Jewellery in Britain 1066-1837: A Documentary, Social, Literary and Artistic Survey. Norwich: Russell, 2000. Yoder, Edwin M. “Otelia’s Umbrella: Jane Austen in a Small World.” Sewanee Review 116.4 (2008): 605-11.